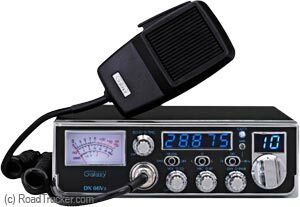 The New Galaxy dx66v2 "Mini-Gal" radio for 2017 has the same performance as before, but now in a mid-size chassis. It comes w/ AM (Amplitude Modulation) only. This radio will fit those tight overhead compartments in big trucks. It features a Built-in Echo board and Built-in Automatic SWR circuit. Powered by dual MOSFET transistors for at least 45 watts PeP power output. Input Voltage: 13.8V DC nominal, 15.9V max, 11.7V min. Microphone: plugin dynamic w/ push-to-talk switch and coiled cord. Frequency Response: AM: 450 to 2500 Hz. Sensitivity: AM: 1µV for 10 dB (S+N)/N at greater than 1/2 - watt of audio output.